Can I recover mental anguish damages under FDCPA if I have depression? 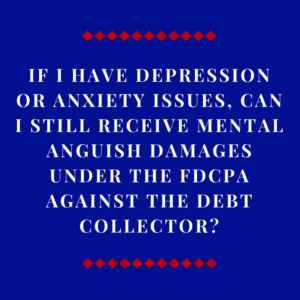 If I Have Depression Or Anxiety Issues, Can I Still Receive Mental Anguish Damages Under The FDCPA Against The Debt Collector? Yes — regardless of what medical or emotional issues you are dealing with, if an abusive debt collector causes you mental anguish, you can recover damages under the FDCPA (Fair Debt Collection Practices Act). If a debt collector violates the FDCPA, you are entitled to monetary damages which includes “actual” or “compensatory” damages. The most common form of compensatory or actual damages is mental anguish or what is sometimes called emotional distress damages. In a nutshell, the jury is to look at where you were right before the abusive debt collection began and then determine how seriously the abuse affected you. Having prior issues with depression or anxiety may make your damages less than others or make the damage even greater. It all depends. Maybe you are more vulnerable to mental distress and the abusive debt collection pushed you into a deep depression. That may be more damaging than someone who has never faced depression who is harassed. Or maybe the harassment has little affect on you due to other issues you are facing. This is something that your lawyer will be experienced in handling and advising you on and how your situation fits the law. Both of these arguments shows either a lack of understanding or a lack of honesty. It really doesn’t matter. The defense lawyer will say you have no mental anguish damages whether you go to the doctor or not; whether you have ever suffered from depression or not; the bottom line is lawyers who defend collectors will always argue you have no damages. But they don’t make the decisions — the courts make the decisions and your consumer protection lawyer can advise you on what is allowable under the law. If you live in Alabama and you want to either sit down with us, give us a call at 1-205-879-2447. Is It Worth My Time To Sue An Abusive Debt Collector Under The FDCPA? Will A Jury Really Award Money To Someone Who Owes A Collector? What Damages Can You Recover Under The FDCPA Against A Debt Collector?